The universe may grow like a giant brain, according to a new computer simulation. The results suggest that some undiscovered, fundamental laws may govern the growth of systems large and small, from the electrical firing between brain cells and growth of social networks to the expansion of galaxies. Natural growth dynamics are the same for different real networks, like the Internet or the brain or social networks, said study co-author Dmitri Krioukov, a physicist at the University of California San Diego. The new study suggests a single fundamental law of nature may govern these networks, said physicist Kevin Bassler of the University of Houston, who was not involved in the study. At first blush they seem to be quite different systems, the question is, is there some kind of controlling laws can describe them? By raising this question, their work really makes a pretty important contribution. Past studies showed brain circuits and the Internet look a lot alike. But despite finding this functional similarity, nobody had developed equations to perfectly predict how computer networks, brain circuits or social networks grow over time. Using Einstein's equations of relativity, which explain how matter warps the fabric of space-time, physicists can retrace the universe's explosive birth in the Big Bang roughly 14 billion years ago and how it has expanded outward in the eons since. So Krioukov's team wondered whether the universe's accelerating growth could provide insight into the ways social networks or brain circuits expand. The team created a computer simulation that broke the early universe into the tiniest possible units - quanta of space-time more miniscule than subatomic particles. The simulation linked any quanta, or nodes in a massive celestial network, that were causally related. 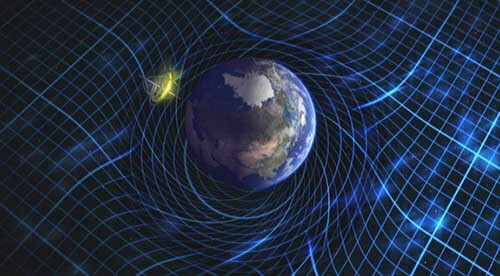 Nothing travels faster than light, so if a person hits a baseball on Earth, the ripple effects of that event could never reach an alien in a distant galaxy in a reasonable amount of time, meaning those two regions of space-time aren't causally related. When the team compared the universe's history with growth of social networks and brain circuits, they found all the networks expanded in similar ways. They balanced links between similar nodes with ones that already had many connections. For instance, a cat lover surfing the Internet may visit mega-sites such as Google or Yahoo, but will also browse cat fancier websites or YouTube kitten videos. In the same way, neighboring brain cells like to connect, but neurons also link to such "Google brain cells" that are hooked up to loads of other brain cells. 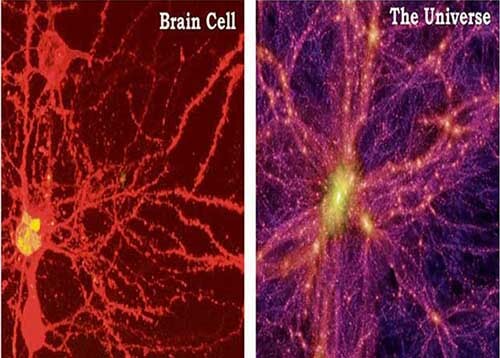 The eerie similarity between networks large and small is unlikely to be a coincidence. For a physicist it's an immediate signal that there is some missing understanding of how nature works. It's more likely that some unknown law governs the way networks grow and change, from the smallest brain cells to the growth of mega-galaxies. This result suggests that maybe we should start looking for it Krioukov told LiveScience November 26, 2012.